Even if you don’t work a 9-to-5 job out of your home office, it’s where you manage your household’s most important financial, medical and educational documents. 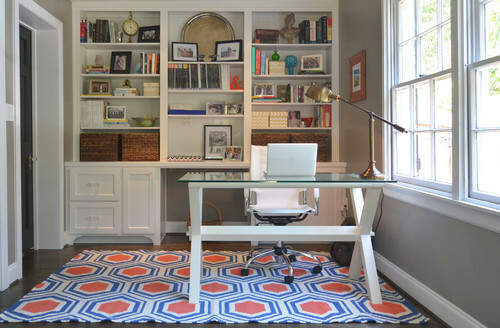 With all of those files, papers, and general cutter, it’s hard to keep the home office organized. Find inspiration to carve out a neat space of your own. Are you unable to quickly locate documents when they’re needed? Create an organized system for storing important documents and you’ll never again waste time searching for items. Follow these simple steps from The Container Store to create your organized filing system. Purge old, obsolete files. Shred items with personal information. Identify what papers need to be placed in active files and what goes in the permanent files. Active files hold resource materials which are regularly referred to for information. Permanent files are rarely referred to but contain records we are required to retain, such as tax and legal records. Select a filing solution based on your needs and space. Active files can be stored separately from permanent files and should be more easily accessible. Choose colorful file folders to organize by topic. Use hanging files for topic and divide subtopics with interior files. Alphabetize main categories to save time. File immediately — the key to keeping your filing system up-to-date is to file things right away. Always have plenty of folders and labels on hand. Set a recurring time to review your files and keep them up to date. Before determining what you’re going to place in each drawer and how it will be organized, line it! Drawers in different areas of the home require different types of liners. In the office, you may opt for a more decorative liner. Keep in mind the location of each drawer when selecting a system. Drawer organizers for offices can be made of natural materials like woven fibers, fabric or wood since they will be less likely to be exposed to moisture, water or stains. Select a designated area within each drawer for each office supply. This allows for quick accessibility and also for quick transport of supplies to other areas of the home for work or craft projects. It also lets other family members know exactly where an item can be found or replaced after each use. Keep cords and cables under control with clever systems from The Container Store. These are perfect solution’s to contain cords at your desk or even an entertainment center. Creating a space that is comfortable, functional, organized, and fits well within the design scheme of a home can be a challenge.